There was an explosion of creativity, wealth and power in Egypt that would make it the envy of the world. After defeating the Hyksos invaders, successive Pharaohs expanded and maintained their Empire through both force and diplomacy. 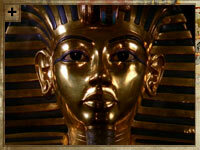 In the process, they won Egypt vast amounts of gold, influence and respect. They included; Ahmose, Hatshepsut, Tuthmosis III, Amenhotep III, Akenhaten, Tutankhamen and Ramesses III. 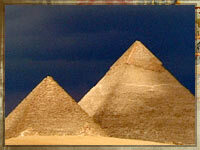 Behind the power of the Egyptian empire lay a vast wealth of natural resources. Chief among these was the river Nile, the freeway of the ancient world, whose floodplains also provided huge expanses of fertile farming ground that kept Egypt self-sufficient and usually famine-free. Along the banks of the Nile, the humble papyrus plant was used to create a bureaucratic efficiency and cultural sophistication previously unknown to mankind. To the south, in the deserts of Nubia, gold mines gave Egypt the unimaginable wealth that formed the real power behind the throne. The same gold also saw the start of a golden age for Egyptian art and architecture, as Pharaohs built magnificent temples and tombs for themselves and their families. But the Pharaohs are only part of the story. Although they sat at the top of society, Egypt's success and legacy owes a great deal to those beneath them: the soldiers, craftsmen, priests and farmers. Just as important were the women. Egyptian religion gave women a central role in the divine order and they were seen as central to their husbands' success. Although there were few women in power like Nefertiti and Tiy, all women were treated with respect and enjoyed legal rights that other women would still be waiting for, thousands of years later.